Have you ever had a homeschooling day where you feel as if you didn't accomplish A SINGLE THING? Maybe a toddler derailed your plans - maybe it was a moody teenager. Perhaps you got out of bed with the best intentions for the day, but nothing quite seemed to get done. I know that there have been PLENTY of those days in our homeschool, especially in our early years when I felt my children should guide most of their learning. I had a theory that if I followed my children's lead, then beautiful learning would occur. A lot of the time it did, but some of the time it resulted in a disjointed sense of learning and little accomplishment - aka a dreary homeschool day. Three years ago I stumbled upon a concept that changed everything. It helped us make the most of our precious homeschool time. This one thing guaranteed my children would have TRUTH, BEAUTY, and GOODNESS in each of their homeschool days - even if those days were derailed by circumstances out of my control. This one thing changed our homeschooling days dramatically - and I'd love to share it with you today. That one thing is Morning Time --- or WHATEVER time of the day you want to use that is most convenient for your family! Children and adults NEED structure and predictability. This routine improves behavior and gives our children a sense of security because they KNOW what is coming when they get out of bed each day. As a homeschooling parent it has always been my goal to expose my children to truth, beauty, and goodness. Giving my children just a little of each of these - first thing in the day - lets me feel a sense of accomplishment no matter what else happens in the day. We all need an anchor. Morning Time gives my children (and me!) that anchor. It's the one thing that remains constant, and a time when we are together. Without it, a day feels incomplete. Morning Time centers our hearts and minds on those things of beauty and reminds us of our mission as home educators. Over the years this has changed based on our school plans for the year and the ages of my children, but generally we include three big things in our Morning Time. Keep it simple. Don't try and throw too much into this time. Normally, a 30-45 minute time over breakfast worked well for us. You may have to adjust this is you have little ones running around. Or, don't set your expectations too high -- allow your littlest ones to play on their own in a high chair or safe space while you have Morning Time with the others. If a teen is moody and doesn't want to come to the table one morning, don't force them - they will only negatively impact your time. Choose whatever devotions work well for your children and their ages. We've used devotion books, recited prayers from Luther's Small Catechism, and simply read aloud from our Bible. Our Classical Conversations memory work was always reviewed at this time. My Challenge age daughter sometimes had larger poems she was memorizing or other pieces of memory work, and we would work on these during that time. We studied great artists and their works learned about composers and their works. For a season we would do a drawing or chalk pastels lesson or learn about something in nature for a walk later in the day. Morning Time doesn't have to be fancy. It just needs to be simple, consistent, and beautiful. 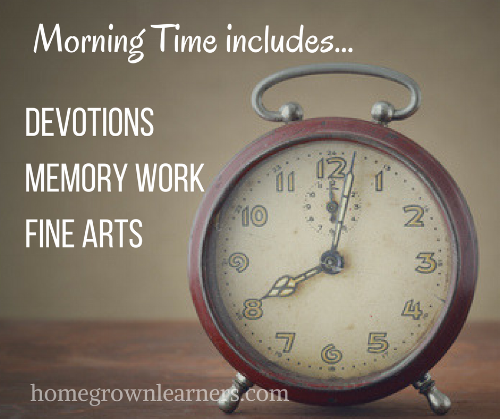 Do you have a Morning Time in your homeschool?